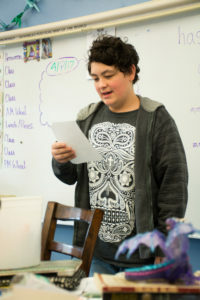 It’s Been a Busy Spring with Vinalhaven School Enrichment and PIE! We also welcomed Art Baron and his wife Ingvild Waerhaug to Vinalhaven School at the end of April. Art is a world-renowned Jazz trombonist. 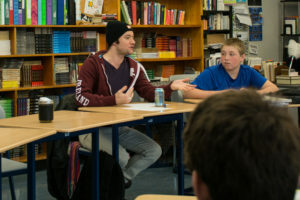 He is a longtime friend of Vinalhaven and has taught workshops in the past. 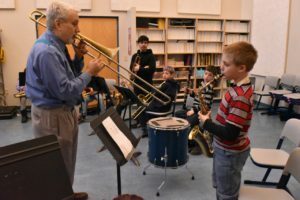 This time, he worked with 4th & 5th grade bands, middle school band, individual high school musicians, and even visited the Pre-K. A Community Concert on April 26th , was the highlight of the residency, with Art, music teacher Bill Trevaskis, and 11 student musicians from Grades 6-12 playing onstage. It was a fantastic show! Ingvild is an artist and designer from Norway and New York City, who uses dyes and paints to create beautiful fabrics and turn ordinary clothing into fashion. 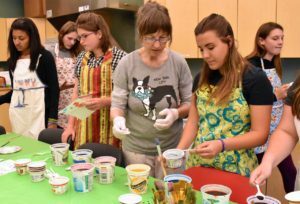 She spent some time with Vinalhaven high school art students who made bright and lively tee-shirts by painting with dyes and stamping with fabric paint. Students worked intently under her direction for three sessions, and were so pleased with the results! Chrissy Fowler is back this week, teaching dance to students during their Phys Ed classes. There will be a Community Contra Dance on Friday, May 12 from 6:30 to 8 p.m. at the school. There will be live music and desserts served. Everyone is invited! Suggested donation is $5.